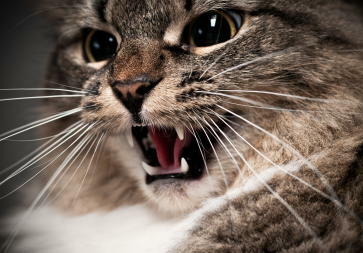 Cat Sneezing - cat flu or allergies in cats or cat illness? How many times do you hear your cat sneezing, see the runny nose, and after several days start to worry. He's eating okay and is active but the worry sets in and off you go, taking him to the vet to be checked out. The vet exams him and informs you that the cat appears to have the feline version of the "flu" and explains that the illness should run its course within a week or so. You are given instructions for keeping your furry friend more comfortable and told to phone immediately if he stops eating or becomes lethargic or weak. You head home, relieved but wondering where your cat contracted this infection and how common such illnesses are in felines and kick yourself for not asking the vet. Your cat's case of cat sneezing is actually an infection of his upper respiratory tract (nose, sinuses, pharynx, and larynx). Typically the feline immune system fends off the numerous infectious agents that attempt to invade the respiratory tract. But cat sneezing, a runny nose and watery eyes may signal that a battle is underway and most of the time, it's a mild, self-limiting disease. The invaders that cause most cases of upper respiratory infection (URI) are one of two viruses: feline herpes virus I (the cause of feline viral rhinotracheitis) and feline calicivirus. Occasionally, a URI is due to infection with the bacterium Chlamydia psittaci. Vets can often tell which disease-causing agent is affecting your cat by the animal's primary signs. For instance, a cat sneezing that has herpes virus infection will likely suffer from severe sneezing. A cat with calicivirus infection probably won't sneeze a lot but may develop ulcers on its tongue and the roof of its mouth, causing excessive salivation. A cat infected with Chlamydia psittaci will primarily suffer from runny eyes. If your vet determines that Chlamydia psittaci is the cause of your cat sneezing, he will probably prescribe an antibiotic ointment to use in the animal's eyes. But if the culprit is viral, there's no effective medication to hasten your cat's recovery. In this case, if your cat is eating and maintaining a near-normal energy level, your vet will likely tell you to be supportive and to monitor your cat closely to spot any secondary infection. To keep your cat eating, you'll need to keep his nose clear of discharge because a cat that can't smell often won't eat much. 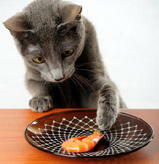 You can also warm your cat's food so the aroma is stronger and better able to penetrate the animal's stuffy nose. Vets occasionally prescribe decongestants to clear a congested cat, but since most cats vehemently oppose anything sprayed or squirted in their nose, these medications are reserved for cases of severe congestion. A viral infection can set the stage for a successful bacterial invasion because the virus can be transmitted indirectly to another cat via a person or a brush. Monitor your cat sneezing pet for secondary infection by observing the consistency and color of any discharge from his nose or eyes. At the start of a viral illness, the discharge is usually thin and clear. But when a secondary bacterial infection develops, the discharge becomes thick and colored (often yellow or white). Worsening lethargy, fever, and loss of appetite may also signal a secondary infection. If your cat develops a secondary bacterial infection, your vet will likely prescribe antibiotics and work to get the animal eating again. Occasionally, vets prescribe antibiotics prophylactically, meaning, to prevent a secondary bacterial infection from developing. But due to concerns about creating antibiotic-resistant bacteria, vets tend to reserve preventive antibiotic therapy for cats with an underlying illness ...such as feline leukemia virus (FeLv), or diabetes mellitus ...that hinders immune function. Some cats suffer repeated bouts of URI and can develop chronic rhinitis (inflammation of the mucous membranes of the nose) as a result of damage to the nasal mucous membranes and the turbinate bones (delicate scroll-like bones that support nasal mucous membranes). The primary sign of chronic rhinitis is a persistent runny nose. Some cases will clear up with long-term antibiotic therapy while others require surgery to clean around the cat's turbinate bones and improve nasal drainage. The best way to prevent URI is with vaccination. Vets recommend all cats be vaccinated against herpes virus and calicivirus. These diseases are easily transmitted, and cats that have recovered from herpes virus or calicivirus can remain carriers for many years, experiencing relapses themselves and infecting healthy cats. Furthermore, the vaccines to protect against these illnesses are safe and effective. While the occasional vaccinated cat will develop a respiratory infection, usually its signs aren't as severe as they would be if the cat hadn't been vaccinated. Don't worry about giving your cat extra shots; these vaccines are included in the combination vaccine FVRCP, which cats routinely receive. Minimize exposure by isolating the cat sneezing from your other cats if you have a multi-cat household like I do. Cat respiratory disease agents can travel a few feet in the air...landing on a second cat. However, since an infection often lies latent for several days or even a week, separating the animal may prove futile. On the other hand, you needn't worry about your cat catching a cold or cat flu from a human family member that can carry the infection from an animal they have been in contact with. Pathogens that cause URI in cats are unlikely to pass infection to people. The more densely populated a space is and the less air flow within that space, the greater the chance your cat will be exposed to an infectious agent. 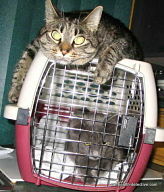 So before you board your cat at a kennel, inquire about disease-control measures. Since many cases of upper respiratory infection run their course without fanfare, there's no cause for alarm if your otherwise healthy cat suddenly develops mild signs (such as cat sneezing) of this illness. But be aware that other diseases ...such as nasal tumors and dental disease ...can cause similar signs. 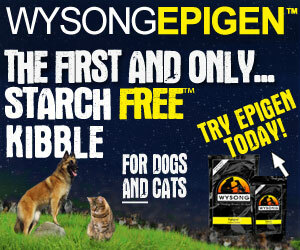 If the signs become worse or don't improve within a few days, have your vet check out your cat.